From Captain's Daughter to Army Mom: Meet Mandy and Jim... And, Mandy's Shrimp & Pasta Primavera! 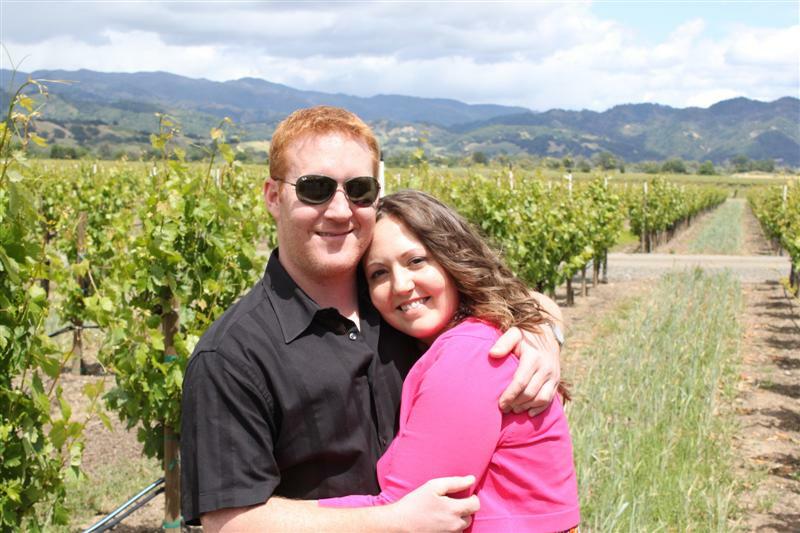 Meet Mandy and Jim... And, Mandy's Shrimp & Pasta Primavera! Hi folks, Mandy from Texas here! I am just in awe of the wonderful people I have "met" through blogging, I swear food bloggers must be the kindest folks on earth. Janet and I have been following each other for a while but never connected over e-mail until it dawned on me recently that we should swap posts and introduce our readers to each other. One big happy family I think! If you didn't see her mouth watering Chocolate Biscotti recipe she posted on my blog, Home with Mandy you should jump over later and check it out. She's such a wiz with the baked goods and I'm totally jealous. Like she said on her guest post, I'm the kind of kitchen goddess that throws a bit of this and a dash of that into my dishes depending on what mood I am in or what I have on hand. The science of baking baffles me, but I do promise to try her chocolate biscotti recipe because she made it look so easy! This recipe for Shrimp and Pasta Primavera is exactly the kind of dish I like to have in my back pocket because its flexible and customizable. Pasta Primavera is an Italian pasta and vegetable dish (do we see a trend here with the Italian posts?) Primavera is Italian for spring, and the dish is designed to use up seasonal vegetables so you can really make this your own. 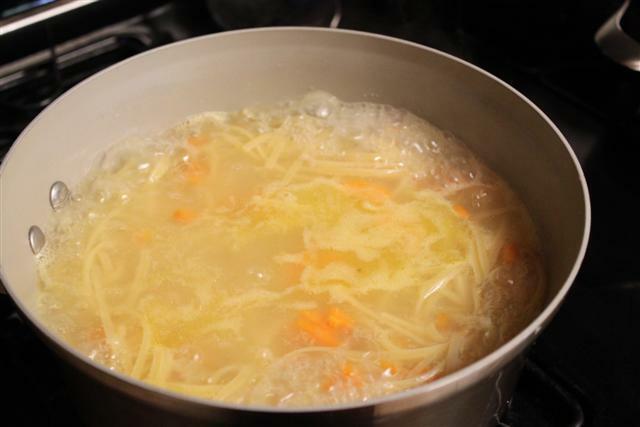 The blend of vegetables used in this dish varies widely depending on location and preference, but onion, carrots, zucchini, broccoli, bell pepper, peas and mushrooms are commonly added. A cheesy cream sauce is blended with the pasta and vegetables in traditional Pasta Primavera but in my carnivore house I try to always add some sort of meat for my husband Jim. 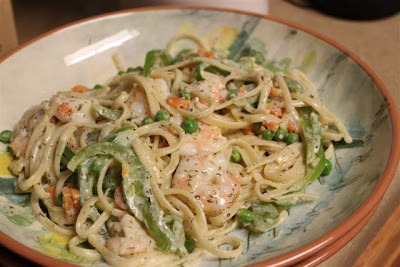 This particular night I added shrimp and the result was "...oh so delicious!" 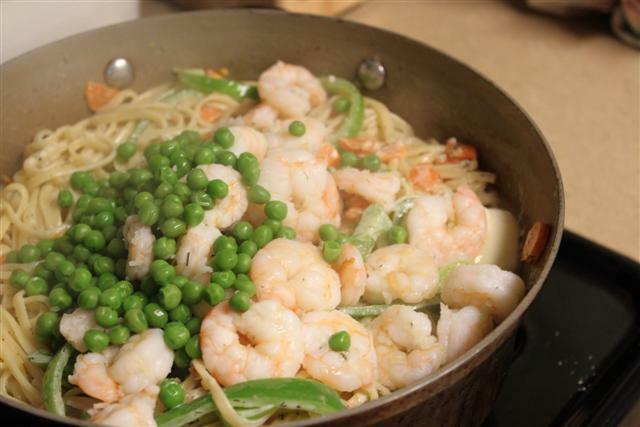 Let's make some Shrimp and Pasta Primavera alla HWM! al dente, adding shrimp and peas during the last 3 to 4 minutes of cooking. Drain well. salt, Parmesan, pepper and thyme. 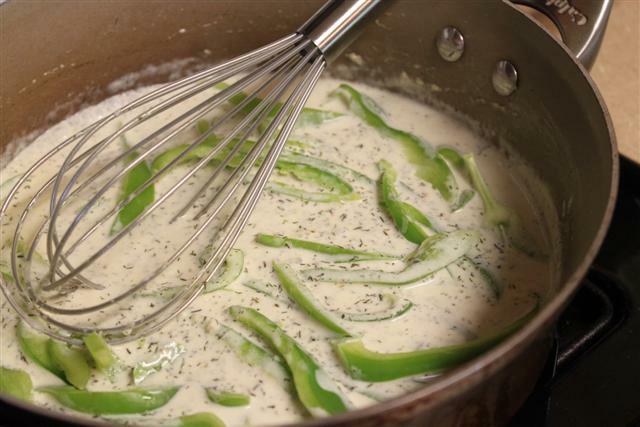 Stir with whisk to incorporate all ingredients. 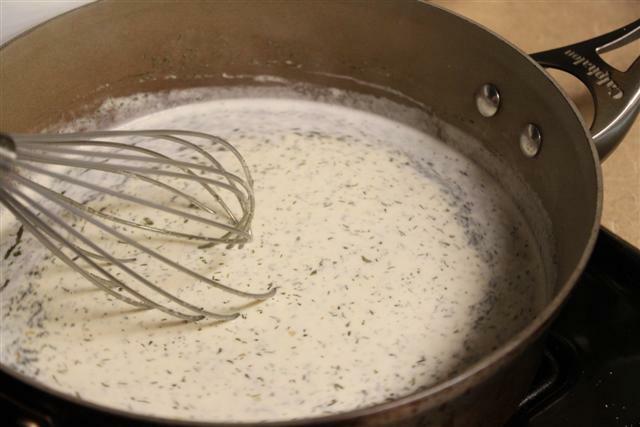 crisp, which is why I added it to the sauce that only cooks for five minutes. 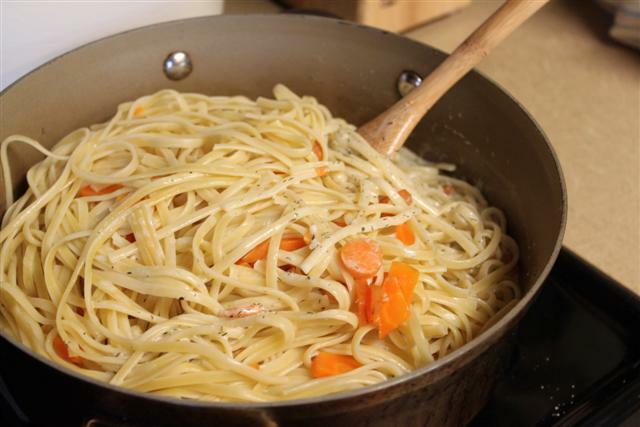 Now throw the drained pasta and boiled veggies in with the sauce. 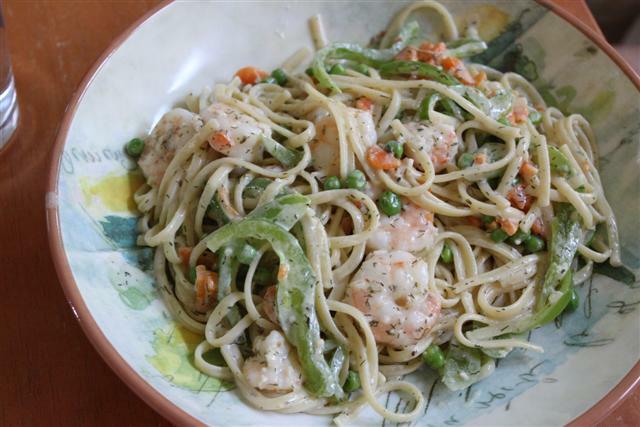 the pasta, shrimp and vegetables with the yummy sauce. much as we have - Too bad I can't ship you a little of this through the mail. Oh my goodness... my shrimp-loving members of the family would drool over this! the sauce looks amazing too! I enjoyed meeting you Mandy! My GREG would kiss me to pieces if I surprised him and created this dish!!!!! Delighted to meet you Mandy! And I've gotta pop over and check out my dear friends biscotti!!!! Thanks Maria and Teresa! We love to eat shrimp in our house, but I'm not a fan of peeling and deveining so I buy the frozen shrimp that are already prepped for me. Well hello fellow Texan! We live in neighboring cities- yay! This looks great. All it needs is a nice piece of crusty bread!